Flashlights can be an irreplaceable tool in your accessory collection, especially when they have the ability to be mounted on a pistol. The J-Rich LED M6 is a dual use flashlight/laser, with a compact mounting deck designed to be attached to pistols with railed front ends. It can certainly be mounted on any other gun with a rail, but on a pistol is where this light really shines. I will be illuminating all of the finer points of this light in this review, so read on for more information! 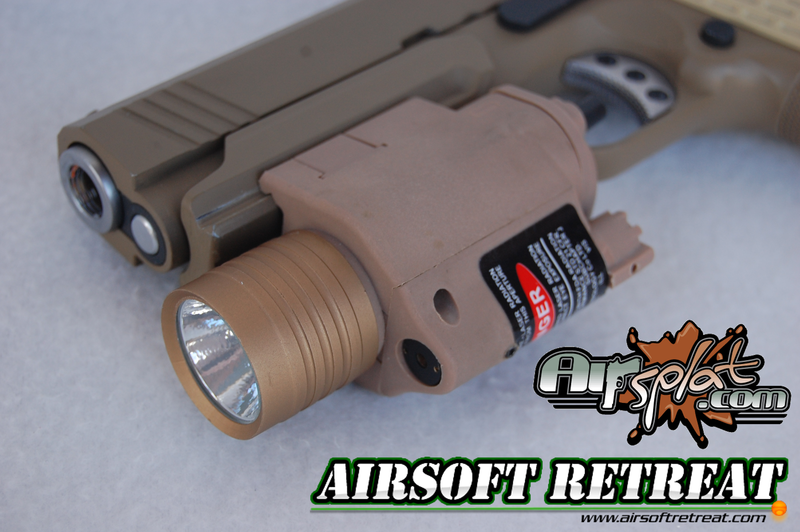 I obtained this light module through Airsplat, who currently has it available HERE, priced at $44.99. They have a black, Xenon bulb version for sale as well, priced $10 less, at $34.99. It arrived safe and sound, a few days after ordering it through Airsplat. They are one of the exclusive retailers who carry J-Rich flashlights, of which I've previously reviewed their M900 light. Their LED offerings are quite nice, and personally, I do recommend them over the Xenon lights, and I will discuss my reasoning why I feel this way later on in the review. The J-Rich M6 is a combination LED flashlight and red laser aiming module, with a QD spring loaded mounting device, designed to be mounted on pistols with railed frames. It has two activation methods; a on-off button located on the left side of the battery cover, and a coiled pressure switch that can be removed for a cleaner look. It is powered by two CR123A batteries giving you 6v of power. For my use, I obtained a set of LiFePO4 rechargeable CR123 batteries, which I will give my thoughts on later in the review as well. J-Rich isn't particularly known for their showstopping packaging, and the M6 is no exception. It arrived in a very plain brown cardboard box, with a high density foam insert, complete with cutouts designed to hold the light securely. Included with the light is the removable coiled pressure switch, and a small hex wrench to adjust the laser. This compact flashlight is constructed mainly out of a high strength polymer that is finished in a tan color. The M6 is also available in black, however, it has a Xenon bulb instead of the LED in the tan model. It is quite light weight, only coming in at a few ounces. The front of the light houses the bezel, which is made out of metal, as well as the laser diode, which is mounted just below the light. The laser has two adjustment screws, for windage and elevation, allowing you to zero it in to your specific gun. I was able to give it a rough zero, which held through the duration of my testing. The back of the light is removable, to allow installation of the two CR123A batteries. The rear cover houses the on-off switch on the left, and the receptacle for the pressure switch plug. It clicks securely onto the main body of the light, so you should have no worries about it coming off accidentally. Just below the cover, on the body of the light is the four position selector switch. It gives you the option of laser, light, laser and light, and off, giving you a lockout function to prevent accidental discharging of the light. The pressure switch works well, and has quite a long coiled wire to allow for mounting on pretty much anything with a rail. I prefer to mount the light on guns where I can access the button without using the wire, so I likely won't use the wire, however, the option to use it is nice. The mounting deck is properly sized, and mounts up to pretty much anything with a rail. The locking button is held closed with a spring, and it locks securely onto everything I tried to fit it on. I prefer to mount this on pistols, since that is what this is designed to mount on. It fits perfectly on Glocks, 1911s with rails, SIGs, etc, so if your pistol has a rail, this should fit well on it. In testing this light, I acquired some rechargeable CR123 batteries, also from Airsplat, available HERE, priced at about $15, a great investment if you use a lot of batteries. The kit includes two batteries, letting you power most lights, however, if you need more, you can buy additional batteries for $3 each. Once the batteries are popped inside, you can see how bright this light really is. It is rated at 100 lumens, but compared to my UTG L337 light, which is rated at 200+ lumens, I think this is brighter than the rated amount. It throws out a well formed, pure white beam, with a nicely focused center spot, and a minimum of excess on the edges. The red laser spot is small and bright, only slightly oval in shape, but very clear, and able to be seen as well as any other red laser that I've tested. Green lasers get all the attention nowadays, but a decent red laser is certainly usable. The LED means that you will get plenty of usage time out of it, as it is much more efficient than the old Xenon bulb system. Compared to the light in the M900, it seems much brighter, even though it uses 3v less. The beam is more crisp, much much whiter, and lasts longer, making J-Rich's LED offerings an excellent choice. Overall, this is a fantastic little light/laser combo that has found its place on several of my guns. It has good battery life, a bright beam, a crisp laser, and it mounts on pretty much anything. I am very pleased with this light from J-Rich, and am looking forward to trying out more of their products in the future! A Led Flashlight is an important tool that every person should have.You would think carrying a Led Flashlight would become too uncomfortable if done daily but not anymore.